You Might Expect Deer On Your Front Lawn ... But Horses? It's always fun to look out your window in the morning and see what animals are around your neighborhood. Birds, squirrels, maybe a few deer ... and horses? That's exactly what happened to one family recently, when they awoke one morning to find a small herd of horses roaming around on their front lawn in their residential neighborhood in Worcester, U.K., Yahoo News reported. "We live on an estate and it takes about five streets to get to us. I have no idea where they came from," Eli Cameron told Yahoo News. 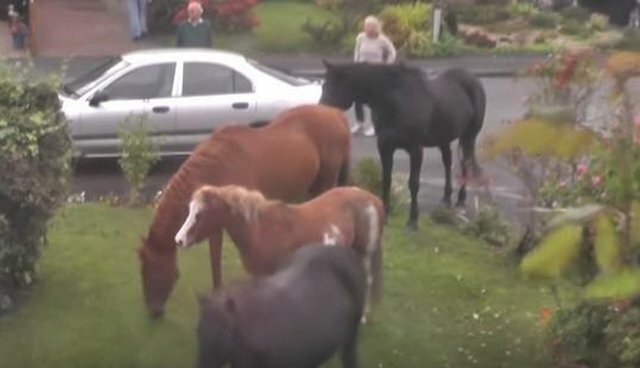 He thought his dad was joking when he yelled that there were horses on the lawn - but wonderfully enough, it wasn't a joke. The police were alerted and able to get the horses safely away from the road, so none of them were hurt. What a sight to see when you wake up expecting a normal morning, right? Maybe the horses were tired of birds and squirrels getting all the attention - they wanted to be able to greet people in the mornings, too.